Advance Merit Scholarship for Board Toppers (For Undergraduate Programs). Advance Merit Scholarship (BU Entrance Test Based). Advance Merit Scholarship (for Outstanding performers in Cambridge International Education (CIE’s) System). 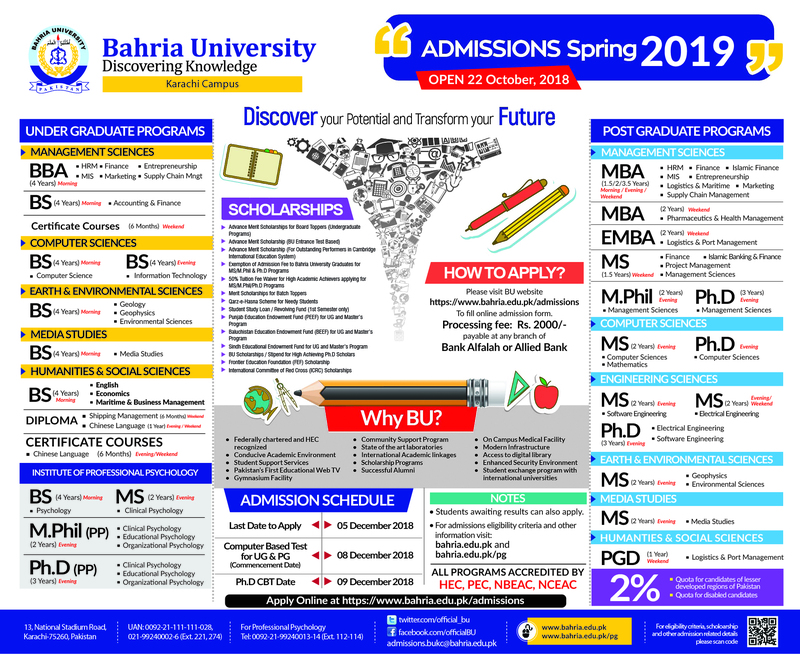 Exemption of Admission Fee to Bahria University Graduates for MS/M.Phil & Ph.D Programs. 50% tuition fee waiver for High Academic Achievers applying for MS/M.Phil/Ph.D Programs. Qarz-e-Hasna Scheme for needy Students. Student Study Loan/Revolving Fund (PEEF) Scholarships for UG & Master’s Programs. Baluchistan Education Endowment Fund (BEEF) for UG and Master’s Program. Sindh Educational Endowment Fund for UG and Master’s Program. Frontier Education Foundation (FEF) Scholarship. Two percent quota shall be kept for disabled candidates. Applicants with disabilities can request reasonable facilities during the admissions process. All such requests must be supported by documentary evidence. A quota of 2% shall be kept in admissions in BU for applicants/ students from less developed regions of Pakistan. 5% seats shall be reserved for the sons/ daughters of Advocates in LLB, who shall compete for admission in order of merit. 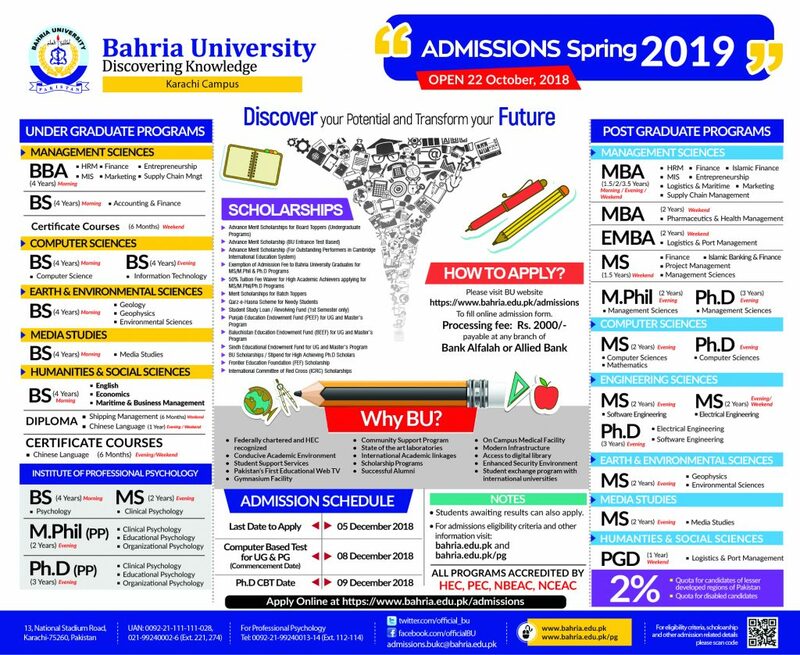 Applicants on reserved seats at para 1,2 & 3 above should fulfill general conditions for admission in BU and must satisfy minimum admission criteria, prescribed for each degree program. Applicants belonging to lesser developed region of Pakistan shall be required to produce duly attested domicile from DASB or other Competent Authorities. List of less developed regions of Pakistan is given below. Applicants shall apply online, on or before the notified closing date. Applicants shall forward their applications to Director admissions at BU Head Office Islamabad to avail above quotas. Requests indicating application number, Programs, Campus along with supporting documents shall reach Director Admissions (after online registration) by quickest means (e-mail/ TCS etc). 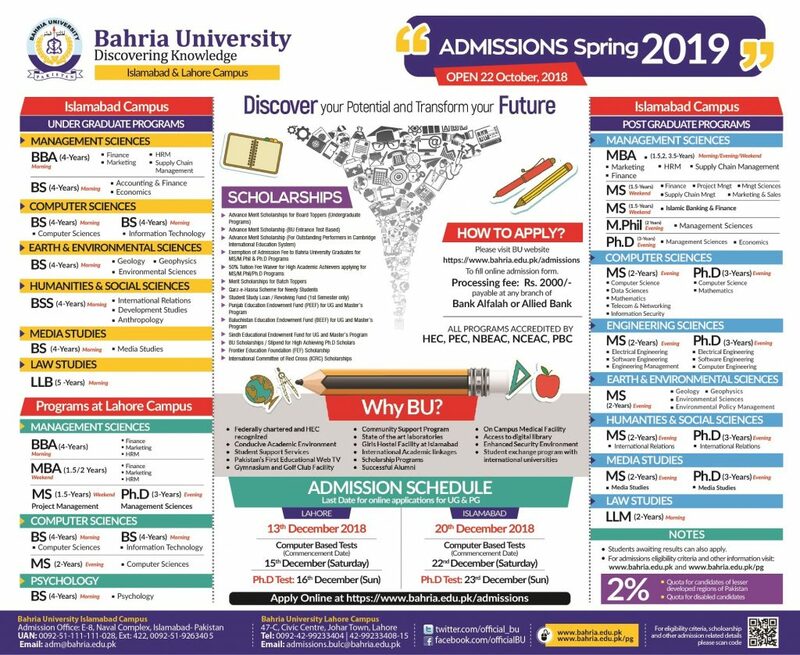 Applicants shall appear in the admission test on the date notified by BU, or produce results of the tests conducted by the specified testing service if so provisioned. Separate merit list of quotas for all Programs shall be prepared and forwarded to concerned campus. Admission Committee of BU Campuses/CUs shall verify documents of applicants in order to look for any discrepancies and ineligible students. No fee waiver is authorized on quota seats. Those who have qualified GRE or NTS-GAT (General & Subject) for MS/M.Phil & PhD Programs. Those who have qualified SAT-I and II for Non-Engineering and Engineering Bachelor Programs respectively. Those who have qualified BU Entry Test during last one year. All applicants are to register on-line and pay registration fee. Qualification of GRE, NTS-GAT and SAT-I/II is to be mentioned at the time of on-line registration. A copy of the results is to be forwarded to concerned Campus (Admissions Office) OR Director Admissions through e-mail, TCS or by hand. Applicants at Para 1 above may opt to appear/re-appear in BU Entry Test for improvement of previous results. It may be highlighted that best results of both or repeated tests shall be counted to prepare merit list. BU Entrance Test in Undergraduate Programs (for Management Sciences & Earth & Environmental Sciences) shall be based on pattern of SAT-I and (for Engineering Programs) SAT-II (Math, Physics & SAT-I English). For all UG Programs, there shall be 100 MCQs in a CBT. Each question shall be presented with four answer option, only one of which shall be correct. The test shall carry 100 marks and time allowed shall be 120 minutes.